Your wedding reception venue is like the icing on the cake — the pop of champagne — the sparkle in the diamond ring. It sets the stage for the entire party and will most likely be the highlight of everyone’s night. But finding the perfect wedding reception location can be overwhelming. Determining the right place to accommodate your needs and the expectations of your guests can prove to be stressful. Even if you have a wedding venue in mind, the idea of then finding a caterer, hotel and other essential amenities is just an extra hassle. Thankfully, Spooky Nook is an all-inclusive wedding venue, helping you each step of the way. At the Nook, we believe the style, mood and overall vibe of your special day should be encapsulated into one perfect night. Whether you have 10,000 guests or a party of 50, we have a flexible space for wedding reception venues. Plus, our banquet hall can transform into any theme you desire. The customizable options are endless; from color scheme and decorations to individual plate settings and name cards. Your wedding is all about you, and we plan to keep it that way. Planning a wedding is no party, and it never gets easier as the big day nears. Worrying about specific bridal party details and trying to determine a food menu may be demanding — but we’re here to help. Spooky Nook offers full-service, on-site catering with an executive chef and banquet staff. 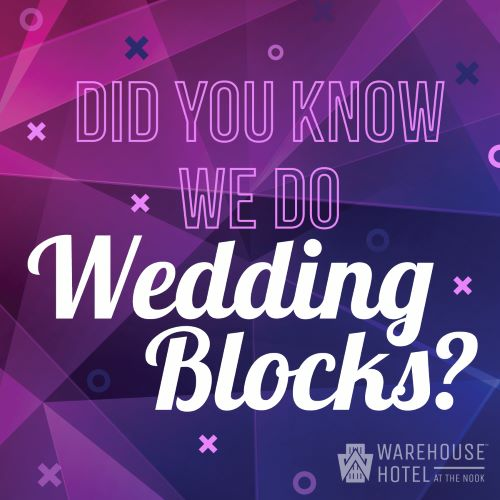 We work with you to accommodate your casual or elegant theme.The Warehouse Hotel is also located on-site. As the party dwindles down and the last song plays, guests can make their way to the hotel to relax and reminisce on the eventful evening. With our luxurious rooms and uniquely comfortable setting, everyone will be able to take a deep breath of recuperation after the party. And let’s not forget about the Spooky Nook Sports complex, also located on-site. Guests have the options of using our climbing gym, Ninja Warrior gym, regulation fields and sport courts, and even an arcade. Your guests will light up with excitement when they see the endless opportunities for fun, making it an ideal location to host a bachelor party or bachelorette party. Spooky Nook is conveniently located 10 miles outside of Lancaster, PA, close to Hershey and Harrisburg. Whether you and your guests are traveling by car, train or air, the route is convenient. To start creating your customized wedding venue, request more information today! © 2019 Spooky Nook Meetings & Events | All Rights Reserved.